Every group leader has three big roles he or she must fulfill. As a group leader myself, I feel the tension of trying to accomplish all of these equally. If you’re like me, you tend to be stronger in one or two of the 3 roles, which means you need help in accomplishing the other ones. 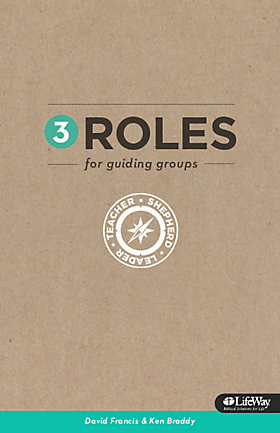 The 3 Roles book that has recently been released by LifeWay Christian Resources is the tenth in a series by LifeWay’s director of Sunday School, David Francis. David invited me to participate in the writing of this book, and together we crafted the contents to help group leaders in their quest to accomplish the 3 key roles we believe every Bible study leader has. Both David and I, plus our spouses, are teachers/group leaders in our two churches. We practice what we preach. Role #1: Teacher – The word “teacher” may not bring to mind pleasant images! Sometimes we think of a teacher as one who stands behind a lectern, delivering a monotone lecture they try to pass off as Bible study. That’s not what we’re talking about when we use the word “teacher”! As we say in the first chapter, “talking does not equal teaching any more than listening equals learning” (p.12). We prefer to think of the teacher (group leader) as the one who guides discovery and facilitates learning. Teachers have the privilege of guiding the Bible study of a group of people, and effective teachers take into account the kinds of people in their groups, the learning methods that help communicate biblical truth to them, and the needs of the people themselves. Role #2: Shepherd – Being a shepherd in biblical times was difficult work…it probably still is! It was also familiar work, and the Lord used the term throughout the Old and New Testament. God is referred to as a shepherd (Psalm 78:52), leaders of God’s people are called shepherds (I Kings 22:17), God’s people are called sheep (Psalm 95:7, Mic. 2:12), and Jesus referred to Himself as a shepherd (Luke 12:32) and as The Good Shepherd who laid down His life for His sheep (John 10:10,11,14). If I had one “do over” in ministry, I would have recruited more shepherds to be teachers. Back when I served on church staff, I tended to look for people who were great teachers…people who could hold a crowd’s attention, and who could communicate effectively. Nothing wrong in looking for that, but I wonder how much better my Bible study groups might have been if shepherds, not teachers, were in charge?! I can teach a person to be a better teacher…that’s mechanics. But it is difficult to teach a teacher to be a better shepherd. Either you love people or you tend to love presenting information. In my experience, groups that stayed together over the long haul didn’t have superstar teachers, but instead had loving shepherd-teachers who watched out for the sheep in their care. Shepherds had a clear understanding that they did not own the sheep…they were simply stewards for their master. Shepherd-teachers who understand that Jesus is the Good Shepherd and has ownership of the sheep have learned a great lesson; they understand that they are responsible to the Master for each of the sheep entrusted to them. You can see that the mission of those groups was to study and apply God’s Word, to evangelize, to fellowship and build community, and to serve others (serve people both inside and outside the church). It was the responsibility of my group leaders to guide their people to accomplishing these four key tasks. That’s a very brief look at just a small amount of the content in the book 3 Roles For Guiding Groups. I hope you might pick up a copy for yourself and consider inviting others to read it with you. Each chapter has a discussion plan, and there are free online resources (a free PDF of the book, a 3-hour conference plan, etc) that you can have by clicking the link below. If you are an iPhone or iPad user, consider downloading the book from the iTunes bookstore for free! That way, you’ll have it everywhere you go. Click here to get free downloads of the book, conference plans for adults, students, and kids, plus other 3 Roles items that will help you in your teaching ministry!